When we moved here in 1997, I had been very ill and we decided to not landscape things. We had bird baths, but little else. I mostly sat near the house because we didn't have the paths or patios established and no plans to do so. We had a gray water system on the house and it would water the back with two irrigation sprinklers. Did you know that the old-fashioned washers, i.e., top loading, use 38-42 gallons of water/load? We had two gentlemen that brought their coffee every Wednesday and sat on a picnic table in the back yard. One was widowed and talked all the time and the other was the nodding head in acceptance. I would sit by the house back then. One day they came to get me and said warblers were diving down and coming up wet in one area. I then called engineering husband to continue this situation. It was a wet year and the Blackland dirt was holding water and there was a large puddle out there. I suggested using the Misting Snakes, like at gardening centers, to drip/mist water into this puddle. I got the snake and Don got a hose connected to well water to start our pond. The birds loved it! My chair was moved out near where I sit today. This worked for a year, then the vegetation started moving towards the water and the trees were suffering. We then lined the "pond" with rocks. This worked for another year or two, then we went out after sundown and moved everything out and prepared it for a liner. Don was out before sunup and installed liner, rocks, gravel and drip, and life went on happily. In 1981 I had breast cancer and a modified radical mastectomy and in 1983, I had reconstruction surgery with a Dow Corning implant, which later was found to be an experimental prototype and only two existed. Around 1995, I was put in the Dow Corning bankruptcy case. Around 2005, they paid out a small portion of my expenses during explantation and my five surgeries afterwards from complications. We used that money to build the Warbler Pond. I showed the pond guy from my perspective, my chair, that I didn't want anything in the way of my view of the birds, and specified many elements of ponds that birds like. One interesting thing is that while the pond was being created, the liner was moved 20' away and activated there. Much like when you move a hummer feeder, we had birds arrive and dive where the pond used to be! I watched this behavior with many arriving birds and wondered what would happen if they were migrating and counting on water at a location and returned to find a new housing development! 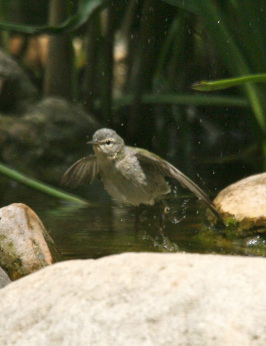 The birds moved in to the new Warbler Pond happily and continue to delight all observers!